A dam holding back the tailings pond at the Mount Polley gold and copper mine in central B.C. failed on Monday, releasing 10 million cubic metres of water and 4.5 million cubic metres of silt into nearby creeks, rivers and lakes. 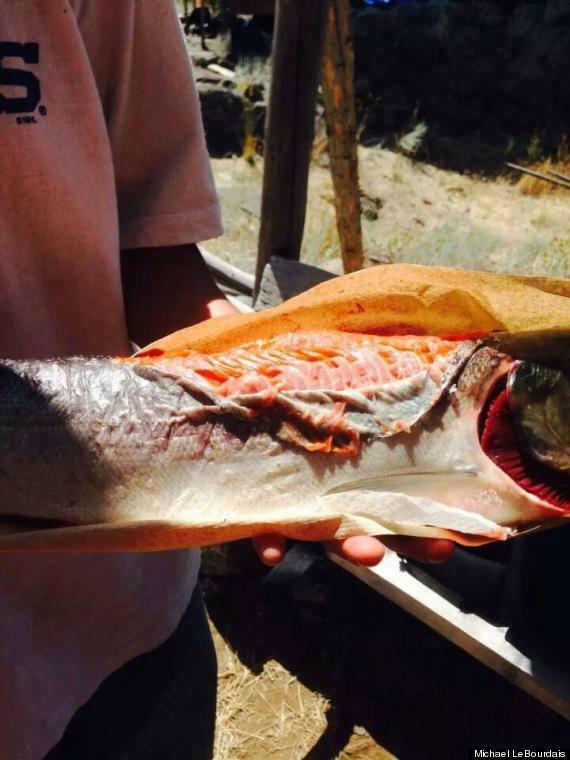 Michael LeBourdais, chief of the Whispering Pines/Clinton Indian Band, posted a photo of a salmon with its skin peeled back on his Twitter account. The fish was caught by his nephew in Six Mile Lake. He said his sister is trying to get samples of the salmon to the Department of Fisheries and Oceans (DFO) for testing. The notices from the chiefs referred to a similar sickly fish being found in Lytton. Since the spill, residents in the region have been warned not to bathe in or drink the water amid concerns that toxic heavy metals from the mine, owned by Imperial Metals, could pose a danger to human health. Water test results on Friday from five locations in the Quesnel River fell within drinking water and aquatic life guidelines, said the province. A water use ban has also been partially lifted, easing drinking, bathing, and swimming restrictions that affected as many as 300 people. The DFO halted salmon fishing in the Cariboo and Quesnel Rivers starting on Tuesday night. LeBourdais said First Nations people are trying to get reassurance that fish caught in area lakes are safe to eat. He said they’ve been anticipating a huge salmon run this year. Some conservationists and wildlife experts are concerned the mine spill poses a threat to sockeye salmon and the animals that depend on them. However, one salmon expert told Maclean's magazine that there should be no impact on the salmon run because any tailings pond contamination would move quickly out of the system and be diluted by a heavy volume of water in the Quesnel River. The Shuswap National Tribal Council and Adams Lake Indian Band are holding a public meeting on Monday to address the Mount Polley spill and its aftermath.